Welcome to our weekly feature, Virtually Overlooked, wherein we talk about games that aren't on the Virtual Console yet, but should be. Call it a retro-speculative. Some of the games we cover in this feature are worth talking about just because of their concepts. Zombie Nation, about a giant flying head, for example. 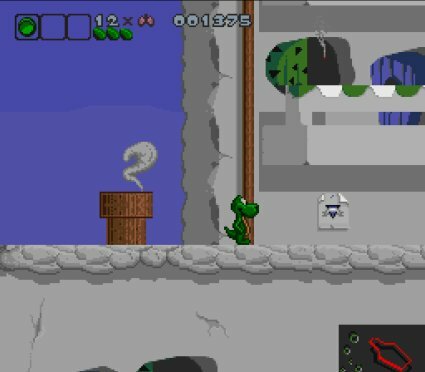 Bronkie the Bronchiasaurus might be the ultimate conceptually-interesting game, at least to us, since it is one of the most bizarre and incongruous things ever to appear on a console. 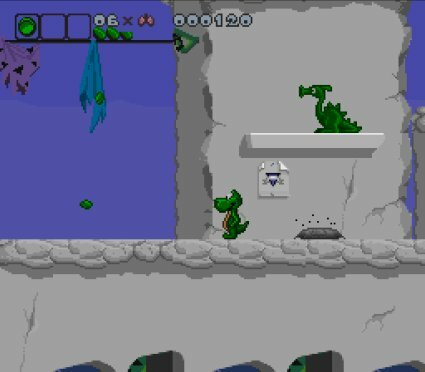 Bronkie is an educational side-scrolling platformer for the SNES about an anthropomorphic dinosaur with asthma. Apparently, Nintendo just doesn't see the importance of asthma education anymore, which is absolutely shameful. Maybe they're afraid that people won't be interested in their own health-related offerings with Bronkie around. Or, you know, they're only releasing well-known games. You can choose the business-sense explanation or the conspiracy theory. We admit, our reasons for wanting to see this game are less altruistic than we may make them seem. We really aren't sure how useful Bronkie is an educational tool, although there's research that indicates that it actually is effective. Our own research leads us to the conclusion that the game is hilarious. First, you're given your "Daily Meds"-- facts about asthma and its treatment, while Bronkie demonstrates proper use of an inhaler. 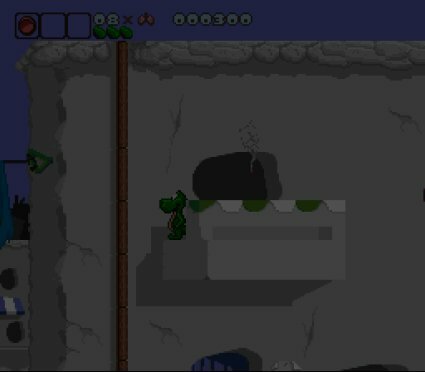 Then, as Bronkie (or, in 2-player mode, his friend Trakie), you walk around a Flintstones-esque city looking for parts to rebuild a large wind machine that had previously kept asthma-inducing dust away. You have to avoid asthma triggers like cigarette smoke, dust, and chemical drips(?) that cause the screen to go dark if contacted in excess. This can be fixed by inhaler use or "calling for help" (resetting the level). There are also dinosaurs attacking Bronkie for some reason (that reason most likely being "it's an SNES game"). You defeat them by either poking them with a stick or blowing strong wind at them. 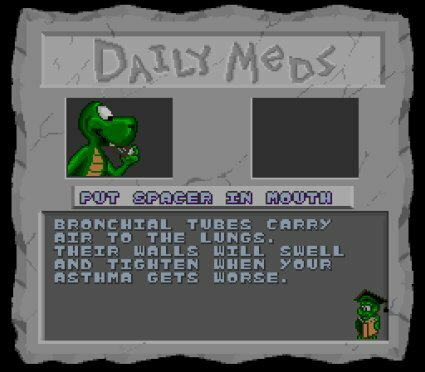 Of course, tragically, Bronkie only has a limited number of strong breaths at his disposal, which can be replenished with lung items found around each level. Other, more helpful dinosaurs give you transportation, items, or wind machine parts if you answer their asthma trivia questions correctly. So they're still jerks for putting that condition on their assistance, but at least they don't try to kill you. Bronkie is part of a series of health-education games from Raya Systems. Other entries include Rex Ronan: Experimental Surgeon, about a doctor who shrinks down to fight a tobacco executive's cancer; Packy & Marlon, about diabetic elephants; and Captain Novolin, about a diabetic superhero under constant attack from animated donuts and cookies. All of these games have the best of intentions, and they're all unintentionally hilarious. Who knows? Nintendo distributing these cheaply might even be a public service-- Raya Systems wouldn't have to pay for packaging or cartridges. Next week: Join us as we take a look at a controversial classic from Rare.